IMHO The best advice I was given is to put a giro in the rudder servo as the most difficult time is when to are close to the ground with little speed. It might just buy you enough time to work out which one has quit and engage your plan. For me on the sim its working out which motor has quit, get the rudder in fast and you can hold it, put the wrong rudder in and its all over. I have a TN Ta154 with no rudder, but differential throttle mixed into the ESC's and I am going to try out varying degrees of speed control + I could cut one and see how it goes 3 mistakes high! The only problem is I'll know which one is going to quit and when and that's my point about having a plan! Its a time and money investment issue for me, the Ta154 is low cost and easy to fix, but the mossie is the complete opposite as BH don't make them anymore. PS I did think about air speed feedback into the speed control to prevent stalling, but then you need to flick switches as you touchdown assuming its not the U/C or flap switch you get instead! Agree totally Chris. Why commit something so precious, invested in time and money when slight assistance is available. A stabiliser can be switched off or removed later if the model fly's so well. And learning a twin for the 1st time. I once test flew a prototype Lanc. for a local business which planned to market them. One motor soon quit and I could not shut down the other due to lousy rushed linkages. Holding opposite everything it continued for several minutes in ever decreasing circles until I could hold it no longer. End of project. 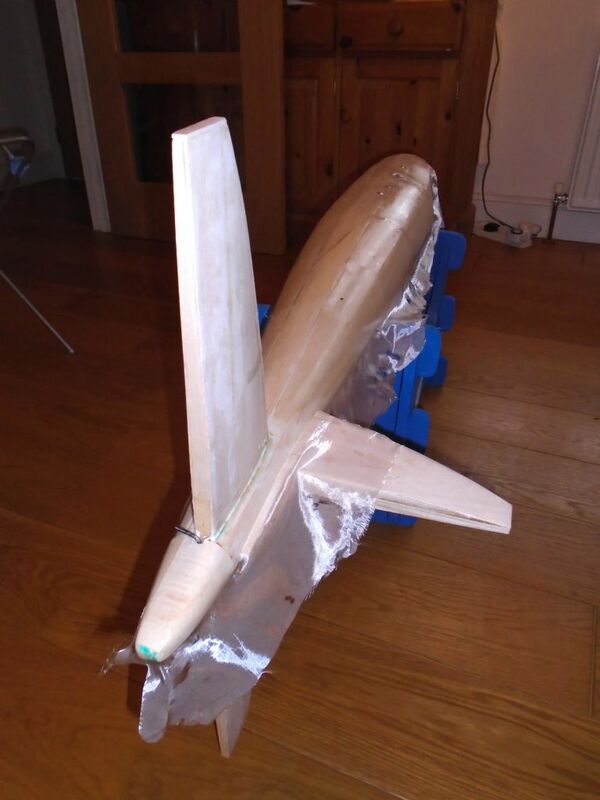 Wanting a similar model myself I built a test rig using an old wing and tail with a simple fus. to hold them together and fitted a pair of OS 26 S`s. Weight 7.5 lbs. 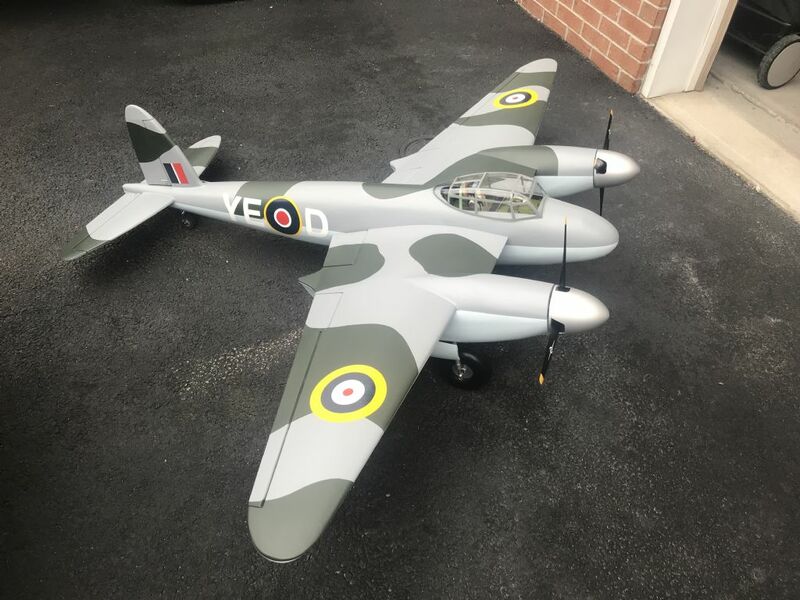 Similar layout to a Mossie with the motors as close as possible to the fus. After a few flights one inevitably quit but all I new about it was that the model slowed down so I circled round and landed it without incident. In the case of my electric Mossie, the ESC must have failed near the start of the take off run. Full opposite rudder had no effect and the combination of this, a little elevator and only one good motor was a recipe for a snap roll which it did even though there was scarcely air under the wheels, so a gyro would have done nothing at this stage. In the air at flying speed I am sure that a correction would have been effective and there would have been time to react. Hopefully this will not happen again with the larger, better quality ESC`s this time wired directly to the batteries and the motor wires extended instead. A tacho check would be a good idea but not so sure about a gyro since the sensitivity would need to be guessed at. You are right on it Martin with your prep and your plan B. The gyro will put you way in front of a wing drop. I played around with gyros on an electric Extra 300 but found the correct settings a little difficult to get. I expect there are much better ones available these days. 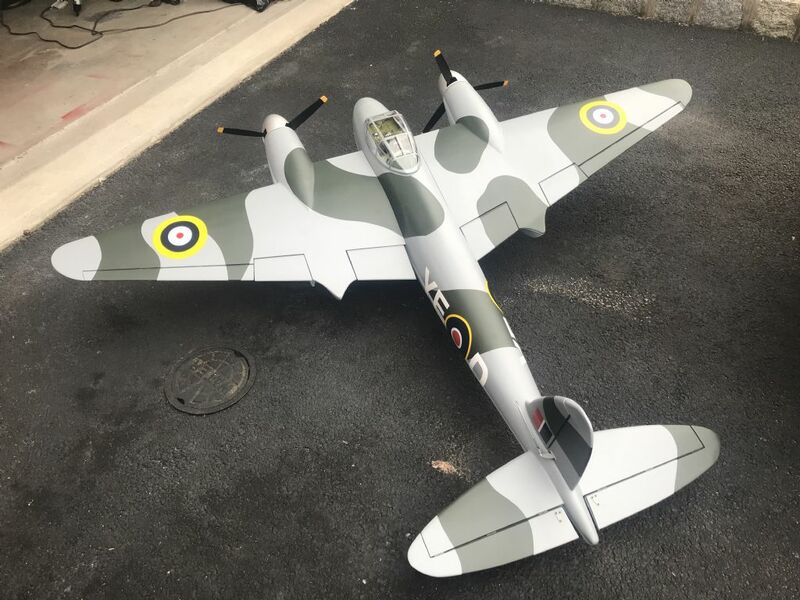 Installation of one in the Mossie could be a teaser since suitable space is very limited. Also, I am using all 9 channels already so none left to switch one on/off. Not even going to consider trying to program my FrSky to replace the JR on such a complex model so will just have to stick with what I know for now. I have been finishing off the glassing this weekend. A bit of sanding to do next and then decide whether to put on a flow coat of resin or go straight to the primer. Best of luck with the sanding. I see that you have not used Danny Fenton`s peel ply method. Wish that I had used glass for my whole model. Easier and strong, but not quite as good as the real thing! What is Danny Fenton`s peel ply method??? It is on a video buried somewhere in the `Don`t just stand there, get one up!` thread. Best of luck finding it. Basically it is a type of cloth brushed onto the wet glass cloth. When fully hardened you simply peel it off. It will have absorbed the excess resin. Does not work on compound curves but they are easy to sand down anyway. Got it! I use the combination "Hotel Room Card" or "Playing Card" to squeegy the resin and cloth down onto the balsa.. Works well and minimizes resin I think..
What will you be painting the bird with? Question: There is quite a long reach Motor to Battery with an ESC in between. Looks like you are extending ESC to Motor leads and having ESC in Fuse? I am doing opposite, extending battery to ESC with ESC in Nacelle. I have no idea which is correct or does in not really matter? Don`t do it Mike, even with the recommended type of extra capacitors soldered directly to the ESC`s one of mine failed for some reason which I do not intend to repeat. Keep the ESC to battery wires short and use heavy duty cable to extend to the motors which on this model are quite close really. Slight drawback will be cooling them but I never bother too much about that normally. If they are considerably oversize they will be doing little work and should not overheat. My Lanc. has four in the fus, no problem. (30A ESC`s, 16-19A draw). My Mossie took 40 something Amps on 55A ESC`s. These are being replaced with YEP 100A. 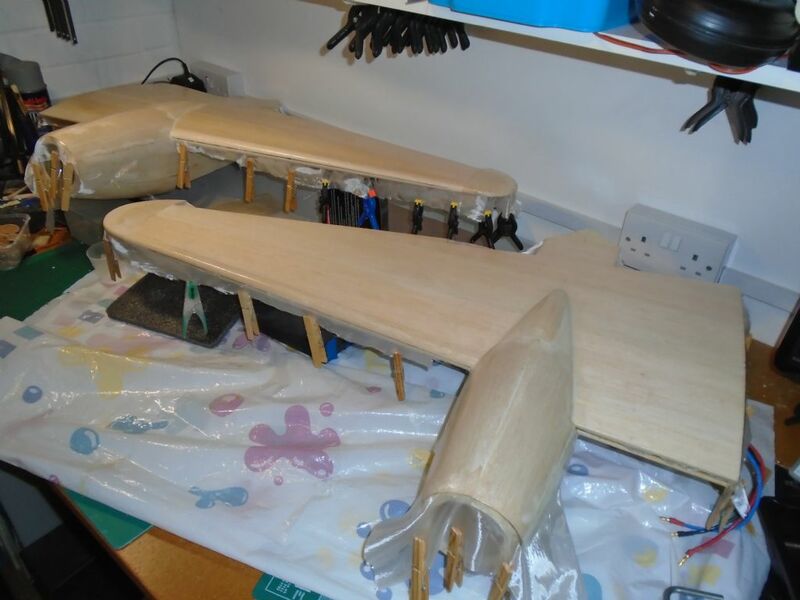 Martin: I tried the peel ply method on the Spitfire that I built prior to the Mosquito. I was using Z-poxy resin and found that the peel ply lifted some of the edges when removed (probably my error when applying the resin). Also, it took a lot of primer to try and fill the weave. This time I thought I would try the Bucks Composite resin and glass. Applying with a roller was easy and seems to have put just the right amount of resin on with little excess. So sanding should be minimised. Mike: I am going to try Valspar paint from B&Q. I purchased a Humbrol pot for each colour and painted a swatch of each. I then got these swatches scanned at B&Q and got tester pots mixed up. Works out a lot cheaper (if it works). I will be spraying. I did a bit of research about extending ESC leads and the collective wisdom was to extend the motor end and not the battery end. As Martin says, doing it the other way means adding capacitors. Hi Geoff, can you tell me where you sourced the electric tail wheel from please? Welcome aboard. 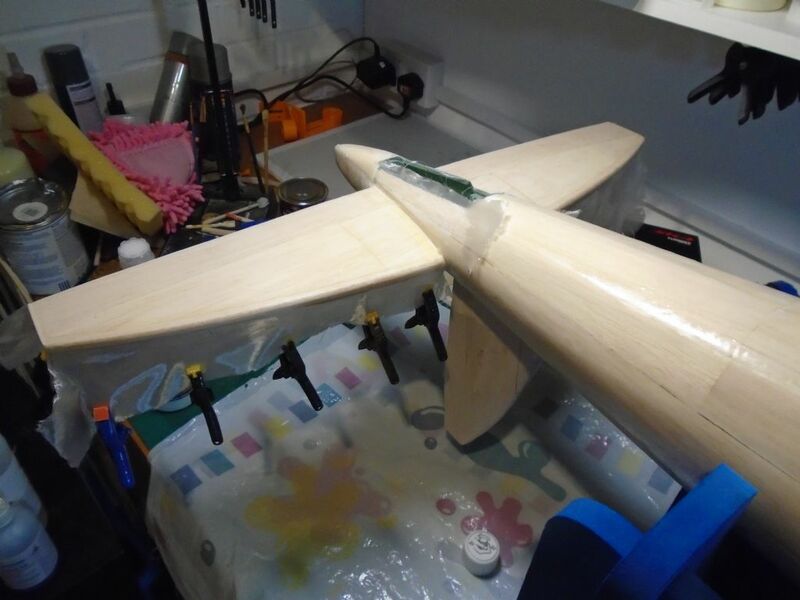 The tail wheel was purchased from Hobbyking. Are you also building the Mosquito? Thanks for that Geoff. Yes, I've made a start and was just thinking ahead but could not track down the tailwheel - maybe because I see it's a nose wheel! I'm a scale glider man really, but fancied a return to a "proper" build and with the motor/battery improvements over the years, I thought this would be a good kit to work my way through. Really nice build thread with good pictures that complement the Tony Niijuis build photos.